Event Insurance for Vendors for 1 day, an entire year, or anything in between is available instantly online. 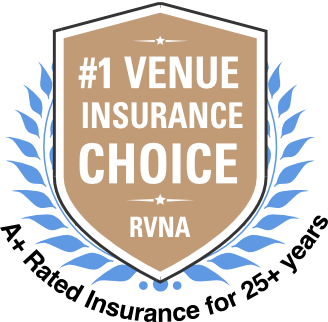 Our Venue Preferred Special Event Liability Insurance protects vendors for lawsuits involving injuries and damage to property. Our Liability Insurance comes with Host Liquor Liability and free, unlimited Certificates of Insurance required by venues. This coverage is our most popular coverage and what most venues require. AD&D (Accidental Death and Dismemberment)/AME (Accident Medical Expense) pays the cost of an injured person’s medical expenses up to the limit, without consideration of who is at fault. It can help avoid lawsuits. AD&D/AME Insurance offers limits up to $50,000. AD&D/AME Insurance can be purchased with Event Liability Coverage. Just ask. Call us at 1-800-364-2433 or take a look at real life coverage scenarios and definitions. Event Insurance in Minutes is offered by R.V. Nuccio & Associates, Inc., providing event insurance for over 25 years. The coverage we offer is preferred and often recommended by venues nationwide. “I love everything about working with RV Nuccio!! We are a boutique style event planning firm who handles 20-25 wedding & events per year. So we must carry liability insurance in order to work at the different venues. The thing I love most is the human interaction. Their response time to my emails is also very fast. They are friendly, reliable and most importantly professional. Their rates are amazing! !